Skin tonic is one of the key cosmetic products for our daily skin care ritual. It’s the last cleansing step, after make-up removal and before application of a moisturizing cream. The tonic removes residue of gels and oils from your face, cleanses the skin and restores skin natural pH balance. It counterbalances the effect of make-up removers and refreshes the skin. Optimal pH makes skin smooth and radiant, so that with or without make-up on, in photos or in reality, your skin looks flawless! If you’re looking for a perfect tonic, you must first know what type of skin you have. Is it dry, normal, sensitive? Does it produce too much sebum? Maybe it needs stronger cleansing? Dry and sensitive skin requires a tonic that is not too strong (so that it doesn’t irritate the skin) and that contains moisturizing components. 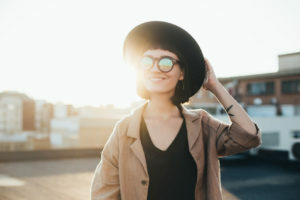 Acne-prone skin, on the other hand, requires strong antibacterial therapy and it’s extremely important that it does not come in contact with over-drying products. 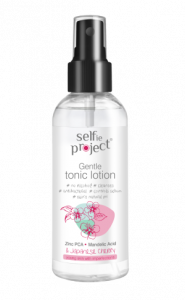 The cleansing tonic by Selfie Project is suitable for all skin types. Zinc PCA and Panthenol jointly fight imperfections. Zinc PCA reduces sebum production and curbs the growth of bacteria. Panthenol has moisturizing properties and soothes irritations. The tonic doesn’t contain alcohol, parabens, SLS or SLES, so it doesn’t irritate the skin. Mandelic acid and Japanese cherry extract have moisturizing and soothing effect, and promote healing of imperfections. It’s a delicate but effective treatment for all skin types. Simply saturate a cotton pad with a little bit of skin tonic and sweep gently over face or spray the tonic directly onto the skin. For best effect use it in the morning, evening and after physical exercise to refresh the look of your skin. Remember about your neck – skin in this area also needs cleansing. The tonic will make your skin smooth, matte and always ready for a selfie!